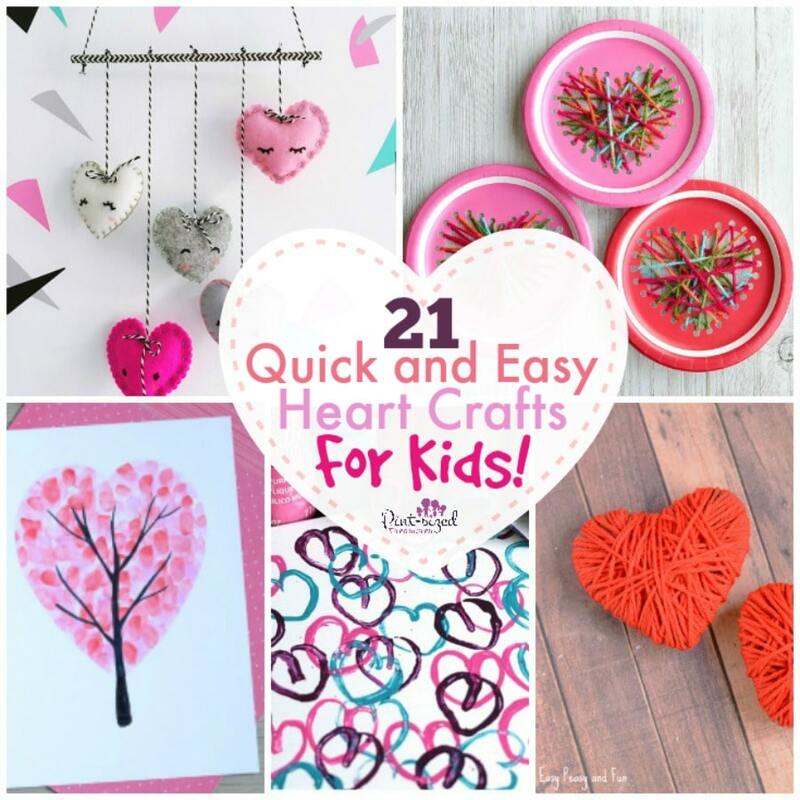 These 21 Quick and Easy Heart Crafts for Kids are totally Doable! 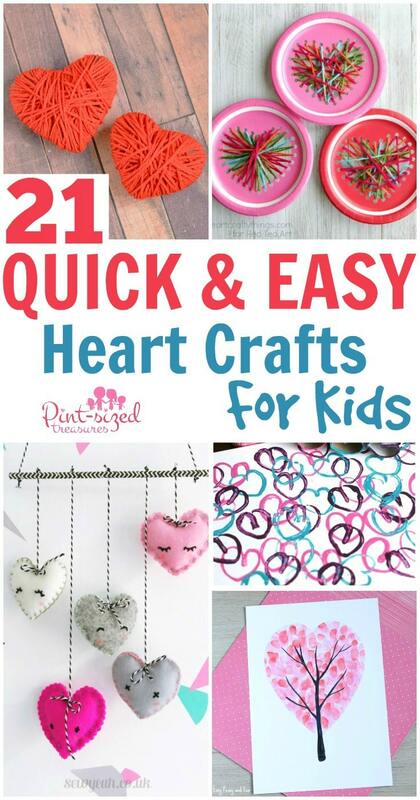 But I’m going to make time to do these quick and easy heart crafts (and even play this heart game) with my kids ! Because quick and easy crafts are a simple, sweet and a fun way to connect with every single one of my kids. Even my teenagers enjoy doing crafts! This mom is not Miss DIY USA, k? My gingerbread house I make just may fall apart. My homemade ornaments on the tree just may have a crack in them. But that doesn’t stop me from wanting to make memories with my kids! I can’t even draw a straight line. You don’t want to hire me to hang your pictures or curtains. But, I can make a mean chicken tender! And I can make some heart crafts with my kids — and you can too! Ready to share a little love this Valentine’s Day jump in and check out this AWESOME list of super quick and easy crafts that busy moms like you can do alongside their kids! Love working with yarn? Try these Yarn Wrapped Hearts Craft. Let’s get to sewing and make this Paper Plate Heart Sewing Craft! I love stamps. You love stamps. Everyone loves stamps! That’s why this Stamping Hearts with Cardboard Rolls is going to be a crazy fun way to create a heart craft! What kid doesn’t love counting, playing and sorting with buttons? All button fans can try out this Sorted Button Valentine Heart that will be a favorite craft this Valentine’s Day! Doilies are just plain adorable, aren’t they? Check out these Watercolor Marker Heart Doilies that are perfect to spruce up any child’s room for Valentine’s Day! I miss my Christmas tree — sniff, sniff. But I have a feeling this Valentine’s Day Tree Paper Craft will help soothe the pain! Awwww! Nothing cuter than little fingerprints in a heart craft, right? Dig into this Valentines Day Heart Fingerprint Tree Craft and enjoy seeing those tiny little fingerprints in a quick and easy craft! Ooooh! This Melted Crayon Dot Heart craft is super adorable! Everyone loves receiving Valentine’s Day cards! Help your child create these Straw Blown Hearts to create some Valentine’s for their friends and family. Wow! This DIY Felt Heart Mobile makes my heart skip a beat! Love me some button art — and I know my kids will too! I think we’ll try out this Button Art Heart for a quick and easy craft — sooner than later! I always have coffee filters laying around the house. I’m sure it will be easy-peasy to make these Tie Dye Coffee Filter Valentine Heart craft! Mosaic crafts are perfect for discussing colors and shapes with kiddos! Try out this gorgeous Valentine Heart Mosaic to have some learning and fun on your quick and easy heart craft day! So Sharpies are good for more than just coloring on the walls?! ;0) I think it will be awesome to teach my kids to use Sharpies the right way — like using them to create these Sharpie and Alcohol Valentines! Whoa! These Salt Dough Conversation Hearts are BEAUTIFUL and look just like Conversation heart candy! FUN! Sweet! This Bouquet of Love coat can be made by someone special and FOR someone special! Pretty up your porch with this Simple Valentine’s Day Heart Suncatcher. What a cute and simple heart craft! My main use for tissue paper is crafting — so many fun things to make! I’d love to try this Tissue Paper Valentine Heart craft with my kids next! Have you ever made a paper chain? You can use them for so many goals and events in your house. Why not make one as a countdown to Valentine’s Day? Try this Valentine Heart Chain to get you started! Glitter and sparkles are what little girls love! Any girl would love these super-cute pink hearts! Grab the tutorial for an Easy Glitter Heart Bunting here!. Fabric Valentine’s make Valentine’s Day for that special someone wonderfully unique. I love unique gifts and valentines! These DIY Fabric Heart Valentines will be super-fun to whip up for a quick and easy heart craft! Now that you have bundles and bundles of heart craft inspiration, which craft will you make first with your adorable, lovable, huggable kiddos?